The Apostle Paul lived twenty centuries ago, yet his words still reverberate in the lives of millions. Vehemently opposed to Christ before his conversion on the Damascus road, Paul spread the news about Jesus throughout what is today Greece and Turkey. Guided by New Testament scholar Tom Yoder Neufeld, learn about the cultural contexts that shaped Paul, his message, and the life of his congregations. Gain new insight as you tour ancient Philippi, Thessaloniki, Corinth, and Athens in Greece. In Turkey, visit sites related to the seven churches of Revelation including Sardis, Pergamum, Laodicea, and Ephesus. Also see cultural locations of interest in Greece and Turkey including historic churches, Greek, Roman, and Islamic religious sites, and modern Istanbul. Optional extension to Italy available. Arrive in Istanbul—the economic, cultural, and historic centre of Turkey. Meet your fellow travellers and settle into your hotel. In the Golden Horn area of the ancient city of Constantinople, see the famed Hagia Sophia, the Blue Mosque, and an ancient underground cistern. Also see the Church of Saint George and the patriarchate of the Greek Orthodox Church, and the Bulgarian steel church. Tour the old Christian and traditional Jewish quarters. Marvel at the Mosque of Suleiman the Magnificent, Topkapi Palace and the Kariye Museum, housed in one of the most beautiful examples of a Byzantine church. Enjoy a relaxing afternoon cruise on the Bosphorus and stimulate your senses with a visit to the Egyptian Spice Bazaar. Cross the Bosphorus and make a stop in Iznik (Nicaea) to reflect at St. Sophia Church where the Nicene Creed was created. In the afternoon, head southwards—to the Great Mosque (Ulu Cami) of Bursa and the city’s ancient covered bazaar. Drive south through rich farming regions to the city of Sardis, one of the seven churches of Revelation. In Sardis, tour the Roman baths, the synagogue, and the Temple of Artemis with its adjoining 4th century church. While there is no evidence of Paul’s mission, the impressive synagogue tells us much about the standing of Jews in ancient times. Peruse the quickly expanding excavations of Laodicea, with its large 4th century church. Planted by the Apostle Paul, the church at Laodicea is also one of the seven churches mentioned in Revelation. Travel to Pamukkale for night. At Hierapolis, next to Pamukkale, see the calcium-whitened cliffs of a natural hot springs resort founded in 200 BCE. In Pamukkale, talk about another one of the churches Paul planted in this location and remember the apostle Philip who is believed to be buried here. In the city of Aphrodisias, dedicated to Aphrodite, goddess of love, wonder at the remains of the temple, stadium, and theatre and learn more at a nearby museum. Tom will give insight into Roman imperial “theology” popular in Paul’s time. At Ephesus, tour one of the most impressive archaeological sites on the tour. It was Paul’s home base for nearly two years. See temples, the Celsus library, the theatre, slope houses, and the church of the Virgin Mary. Visit the Archaeological Museum and the Church of Saint John, with its impressive baptistry. Also tour a present-day carpet workshop where you can purchase Turkish carpets to ship home. Travel north to Pergamum, the location of one of the seven churches of Revelation, and the place where parchment was introduced. In Pergamum, visit the Acropolis, the Temples of Athena and Tiberius, the altar of Zeus, the world’s steepest amphitheatre, and the Asklepion, an ancient shrine and medical centre. Travel to Troy (close to Troas from which Paul left for Macedonia) and see the oldest remains on our tour (14th c. BCE) and the giant replica of the famous wooden horse of the legendary Trojan war. Take a short ferry ride from Asia to Europe across the Strait of the Dardanelles. See the WWI battlefields of Gallipoli and travel across northwestern Turkey to the Greek border. Continue to Kavala (biblical Neapolis) where Paul first arrived in Europe. Visit Lydia, the traditional site of Lydia’s baptism by Paul, and then the ruins of ancient Philippi where Paul established the first European Christian church. Walk the same road on which Paul travelled to Thessaloniki. In Thessaloniki, imagine the lives of past inhabitants at the agora/forum, the church of St. Demetrius, the Arch of Galerius, and the Rotunda—which over the years has been a Roman mausoleum, a church, and a mosque. In Veria (biblical Beroea), see the mosaic commemorating Paul’s mission here, the ancient Church of the Resurrection of Jesus Christ, and the old Jewish quarter. At a museum in Vergina, learn about the Father of Alexander the Great, King Philip II of Macedon, and look at his royal tomb. 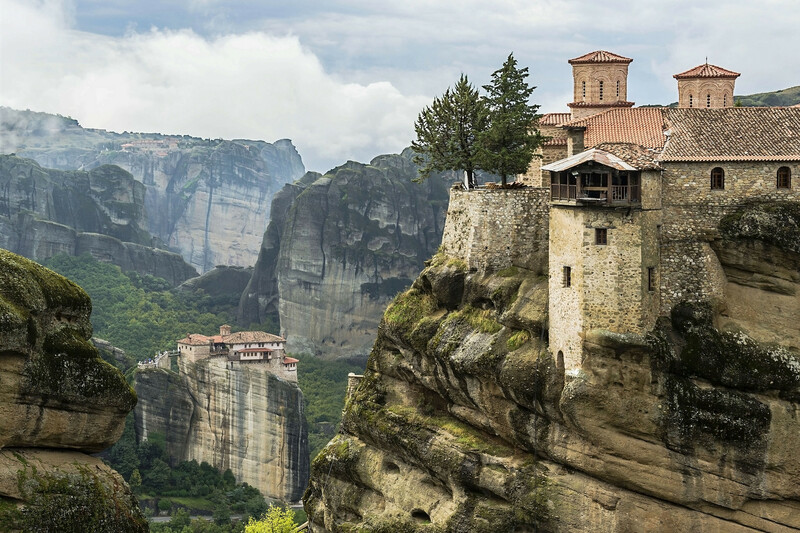 Either late this afternoon or early tomorrow morning, tour one of the wonderful Greek Orthodox monasteries built on immense natural rock pillars high above the plains in Meteora. Watch or participate in an icon painting workshop before continuing southward through scenic valleys and mountains of central Greece to Delphi, ancient home of the Temple of Apollo and the Oracle of Delphi. Tour the site either in the afternoon or the morning following. Continue through southern Greece with a stop at the monastery of Osios Loukas. Travel across the Corinth Canal to the Peloponnese Peninsula, stopping at Epidaurus, the most important site of the Greek god of healing, Asklepios, and the best-preserved Greek theatre. If time permits, briefly pause at Nafplio, the first capital of independent Greece following Ottoman rule. Potentially visit the site of ancient Mycenae on the way to Corinth, where Paul worked for three years. In what was once ancient Corinth, explore significant locations including the ruins of the ancient city and first-century shops, the Fountain of Peirene, the agora, the Temple of Apollo, and an excellent small museum. Pause for a time of worship and celebration of the Lord’s Supper. On the way back to Athens, pass by the ancient site of Cenchreae, home of the church leader, Phoebe. Take a guided city tour of Athens. Explore more famous and important ancient sites in Athens—including the Acropolis with the Parthenon, the Areopagus on Mars Hill, and the Agora. During free time on your own this afternoon you may choose to shop, wander the city, or relax. Enjoy a farewell dinner together at an outdoor restaurant in Plaka, Athens’ old town. Depart for home with new insight into Paul’s travels and teachings, and the life of the early church. Continue your travels after the main tour by boarding an overnight ferry from Patra to Pompeii. Spend the day exploring the remarkably intact remains of Pompeii. Although Paul never travelled to this city buried by volcanic ash in 79 AD, it can help you understand the Roman world as Paul knew it. The Roman houses of Pompeii will give you a glimpse of what early Christian house churches were like. Travel onwards to the Eternal City of Rome. Experience some of the wonders of ancient Rome on a tour including the famous Coliseum, the Roman Forum with the Arch of Titus, and the Augustan Temple. Today, see many magnificent sights in Rome. See the Museum of the Altar of Augustan Peace (Ara Pacis Augustae). Visit the St Prisca church, originally dating to the 4th or 5th century, and perhaps have the opportunity to visit the ancient Mithraeum (a temple to the Roman god Mithras) beneath it. Visit the Insula di San Paolo alla Regola, believed to be the location of Paul’s first visit and house arrest in about 62 AD. After lunch, make your way to Rome’s famous catacombs, where you can view some of the earliest Christian art on the walls of these vast passage ways that served as burial sites for the early Christians. Continue on to the Abbey of the Three Fountains—where Paul was martyred. End your tour at the great apostle Paul’s final resting place, the Basilica of St. Paul Outside the Walls. Depending on your departure time, this morning you may be able to participate in an optional half-day guided tour of the Vatican, the centre of the Roman Catholic church which features important religious and cultural sites. Then say farewell to your fellow travellers as you transfer to the airport for your flights home.